Welcome to the marriage of quilting and travel. Have you ever returned from a trip and wondered how you’d possibly use that theme fabric you bought? Many of us travel; whether Europe after graduation, a cruise, a road trip following retirement, or to the coast for a long weekend. We buy fabric, gather postcards, a shell, a souvenir pin from the nature center, and on and on. My goal is to teach the traveler to combine fabric and souvenirs into a wall hanging that captures the memories from the trip. The wall hanging is a visual reminder of a trip of a lifetime or perhaps just a trip that touched our heart. It isn’t a major commitment of time or wall space, but becomes a tangible reflection of our travel memory. If you've ever traveled and bought fabric, this is the site for you. Many of the fun travel fabrics are not ideal for traditional quilt patterns. Through my lectures and workshops, I can show you how to use that fabric and other memorabilia you've brought back. When you’ve returned from your trip, create a travel memory quilt that uses fabrics, souvenirs, and pictures you’ve collected. Visit Lectures and Workshops and my Speaking Schedule to learn more. For examples, see my Portfolio. Or if you’re a shop owner in a tourist area, I can design patterns and kits that capture the features of your area and utilize fabrics from your store – see Design Services. If you're part of a quilting community in a scenic area, consider creating a travel quilt as a fund raiser. 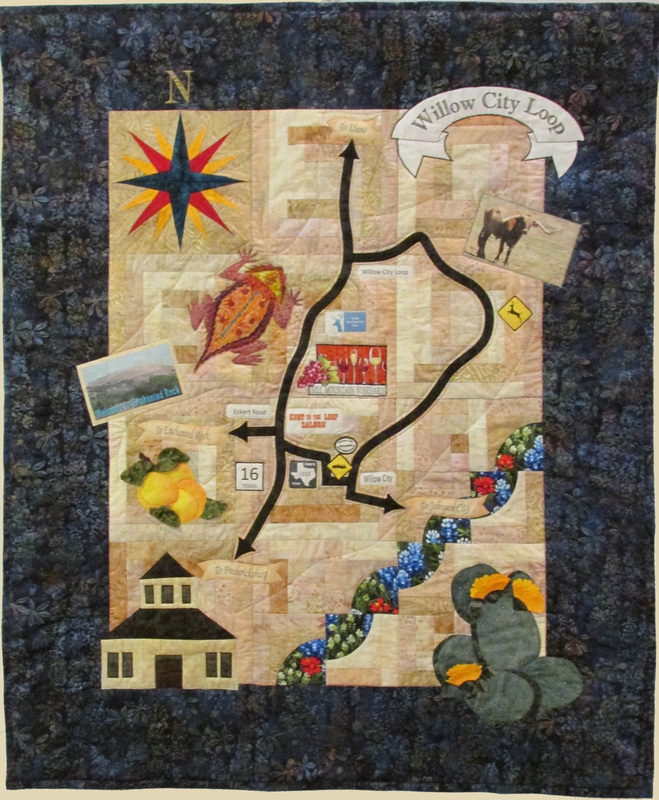 My Willow City Loop quilt raised $5,200 for the Willow City Volunteer Fire Department. Check out the Patterns sections for easy fast patterns that are perfect for motif fabrics.